Impossible Chronology Claiming History Is Wrong!? - Ancient Explorers Impossible Chronology Claiming History Is Wrong!? Archaeologists have made it possible willingly or unwillingly, to question history as we know it thanks to the numerous discoveries that have been made in the past. Strangely, there are quite a few ancient texts that speak of times where Giants, heroes, gods and demigods ruled over Earth. These mysterious beings, considered by researchers as myths, ruled on planet Earth for hundreds and even thousands of years, and their legacy was written down in ancient texts such as the Sumerian King list, the Turin Papyrus, the Palermo stone, and numerous thinkers and researchers such as Eusebio of Casarea and George Syncellus have studied these so-called “myths” coming to interesting conclusions that challenge mainstream history. According to Eusebius of Caesarea, who was a Roman historian, exegete, and Christian polemicist of Greek descent, a dynasty of gods ruled Egypt for 13.9 thousand years: the first was god Vulcan, the god who discovered fire, after him Sosis of the Sun, Isis and Osiris of Saturn, Typhoon brother of Osiris, and Horus the son of Isis and Osiris. they were followed by a dynasty of heroes and demigods who ruled for 11,025 years. This makes it a total of 24.925 years of reign. Approximately around 3000 BC, the first “human” pharaoh would take rule as Egyptian pharaoh. According to George Syncellus six dynasties of gods reigned for 11,985 years. The god of fire Hephaestus, Helios or Sol, Agatodemon, Cronus or Saturn, Osiris and Isis and Osiris’ brother Typhon. The first 9 demigods are Horus (son of Isis and Osiris), Ares, Anubis, Heracles, Apollo, Amon Titoes, SOSUS, and Zeus, and these 9 demigods covered a period of about 2645 years kingship in ancient Egypt. Succeeding dynasties of demigods, spirits and heroes covered thousands of years of Egyptian rule. all of this was, according to Syncellus, way before the first official pharaoh ruled over ancient Egyptian as mainstream history tells us. 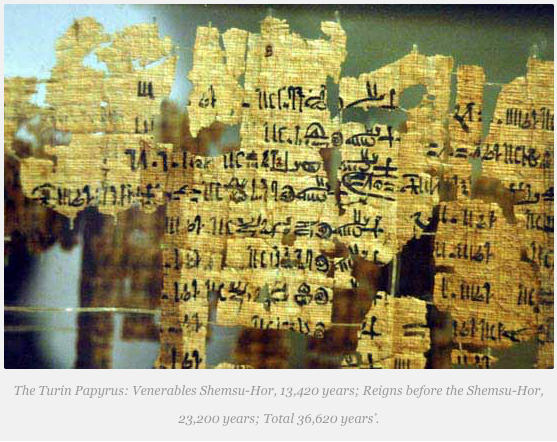 Why has history and researchers ignored the Turin Papyrus and its chronology? Just like the Sumerian King List, it is believed impossible. From the remaining pieces of the invaluable list referred to as the Turin papyrus, it is possible to establish nine dynasties belonging to the predynastic Pharaohs, among them are: the Venerables of Memphis’, ‘the Venerables of the North’ and, lastly, the Shemsu Hor (the Companions, or Followers, of Horus) who ruled until the time of Menes. 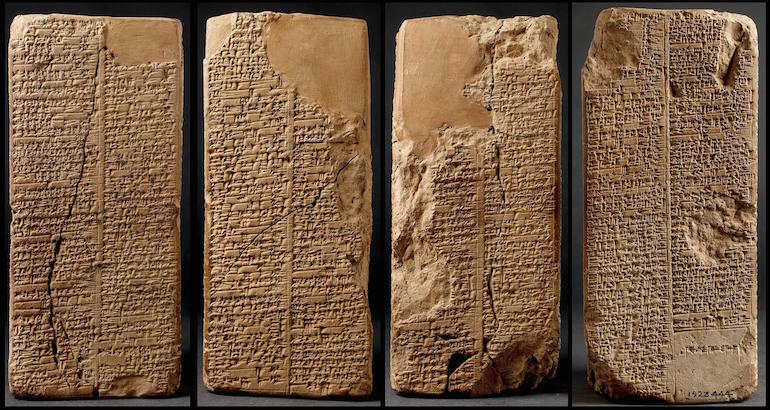 The Sumerian King list has another incredible story to tell, and just like the Turin Papyrus, it has been tagged as impossible by the archaeological and historical community. The best preserved specimen of the Sumerian King List is called the Weld-Blundell Prism, which is a clay, cuneiform inscribed vertical prism housed in the Ashmolean Museum. The Weld-Blundell Prism was written in cuneiform around 2170 BC by a scribe who signed as Nur-Ninsubur from the end of the Isin Dynasty. This incredible document provides a comprehensive list of the Sumerian Kings from the beginning, before the great flood, and the 10 kings who lived before the Flood who lived for thousands of years. The clay prism was found in Larsa, home of the fourth antediluvian king Kichunna, a few kilometers north of Ur. What are we missing and why is it that mainstream archaeologists and scholars have decided to ignore these invaluable ancient texts which record true history for its beginning?